The fallout continues from President Donald Trump's Monday morning tweet that some "Middle Easterners" were likely among the thousands of Central Americans in the U.S.-bound migrant caravan. To my mind and the minds of many homeland security professionals who know and understand this issue, the president was obviously referencing a homeland security problem about which I often write here, "special interest aliens" (SIAs). That's government-speak for a category of U.S.-bound migrants moving along well-established Latin America smuggling routes from the countries of the Middle East, and also from South Asia and North Africa. For years, DHS agencies have tagged special interest aliens as posing a higher risk of committing terrorist acts because of the presence of Islamist terrorist organizations in some 30-plus Muslim-majority home countries. And if Democrats, progressives, or their cable news allies want to believe this is crazy, racist, Republican fear-mongering, they'd have to somehow fit President Obama's own DHS Secretary, Jeh Johnson, into the conspiracy for putting out this memo in 2016 about the high threat of special interest aliens. A spin-fest ensued over this particular president's suggestion about Middle Easterners moving through Latin America among Spanish-speakers. But his use of that term immediately struck me as a general reference to special interest aliens. Right and left slung rocks on cable TV and in the Twitter universe arguing over whether the president's suggestion was fear-mongering electioneering not based in fact, or a legitimate kind of threat. 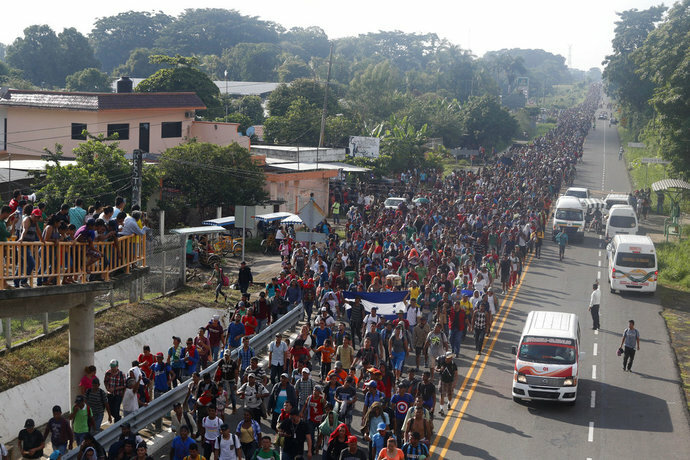 Univision reporter Francisco Santa Anna, embedded with the migrant caravan, said in a Friday report that he saw people from Bangladesh traveling in the crowd as it crossed from Guatemala into Mexico. Santa Anna marveled at the sight "Can you imagine what they had to do to get here? They infiltrated themselves in this caravan and tried to cross with the crowd." Bangladesh has been on the special interest alien country list since 2004 because that country is deeply afflicted by radical Islamist terrorist groups and ideology. So this sighting established a probability that SIAs are indeed traveling with the caravan, even if they're not technically from the Middle East. ISIS and al-Qaeda have been competing with one another for years in Bangladesh, and many citizens of that country went to fight with ISIS in Syria and are returning. It matters that Bangladeshis are on their way because someone will need to investigate to make sure they weren't with the bad guys before we catch and release them into the American interior. To take a different position seems grossly irresponsible and dangerous. Border Patrol Chief Jason Owens of the Laredo, Texas, sector went on Laura Ingraham's show on Fox News and said more than 650 Bangladeshis had been apprehended his sector alone in 2017. He's on the record with information I've been seeking for months. I've logged that for sure. CBP also gave the show statistics showing that more than 280 such migrants had reached the border in the first part of this year. White House spokeswoman Sara Sanders went on the record at a press conference and stated that suspected terrorists had reached the southern border from Mexico in high numbers during 2017 (she said 10 each day, which I think is a mistake, which I hope she corrects). Sources inside the intelligence community have been telling me of unusually high numbers of watch-listed SIA border-crossers for quite some time. Jeh Johnson's 2016 memo lends support, too, that he was seeing intelligence like this. This information is the holy grail; highly classified, so it's great that a government source has gone on the record at least talking about it. And by the way, reporters demanding to see the detailed reports about suspected terrorists of any kind betray ignorance while misleading the public when they expect to get classified information and then, when they don't, tell viewers this is proof of government mendacity. CNN's Jake Tapper is one of those reporters, but still unwittingly did us all a service. He called DHS and demanded evidence to back the president's suggestion that some Middle Easterners are probably in the caravan. He received a stunning immigration story scoop, even if he didn't recognize it as such. It was a list of 22 countries that DHS regards as "special interest countries". That alone is a scoop. DHS told Tapper that it was from these countries that "special interest aliens" had actually been subjected to "Customs and Border Patrol enforcement action" during 2017. True, this wasn't with the caravan, but so what? Tapper later responded to a tweet of mine that he believed these migrants were encountered at all ports of entry to include sea and air. I told him a good reporter would ask for the breakdown and put the border ones on the air, and I sent him Jeh Johnson's memo, which CIS published for the first time back in August. Such a list of special interest countries is highly protected at DHS (I still have a months-old FOIA request in for that list), and Tapper had it delivered to him gift-wrapped with a bow on top just for calling. I guess that's the power of television. On the list are Lebanon, Syria, Iraq, and Saudi Arabia, meaning migrants from those places got caught at the southern border after long smuggling journeys through Latin America, along the same trail no doubt as the latest caravan. Those countries are in the Middle East. That's the least of it. Afghanistan and Pakistan were on the list Tapper obtained, as were Mali, Somalia, and Sudan — a U.S.-designated state sponsor of terrorism for many years. I was a reporter for 23 years, so I understand the demands for evidence. But I've also served as a counterterrorism intelligence professional for many years. I've seen what's there about special interest aliens and the border, and I know it mostly resides in classified homeland security environments known as sensitive compartmented information facilities, or SCIFs. If good for nothing else, the caravan at least made a few more Americans aware of this border threat. Let the release of information continue. One other note: I watched television news personalities mock the president's citation of this threat issue. But from my own professional experience, I know that whole cadres of homeland security professionals are diligently working on the special interest alien problem every day and have done so for years, in dangerous foreign places and at home. To them, I say, don't let them get you down.